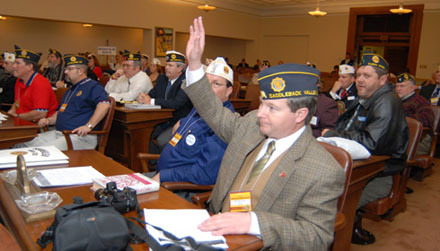 The American Legion National College enhances knowledge and appreciation of The American Legion, and teaches the core values and contributions of the organization, its Auxiliary, Sons of The American Legion and many subordinate programs. The National Legion College prepares young Legionnaires for leadership positions in posts, districts, counties, and departments through education, development, and motivation. The curriculum challenges student leaders to think critically and creatively about issues confronting the Legion. The curriculum centers on self-taught, small-group sessions supervised by graduate facilitators, staff members, contracted professional speakers and national officers. Students review The American Legion’s core values, develop new ideas and consider the future. 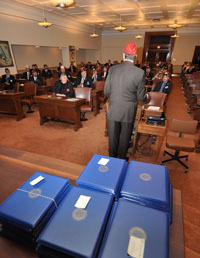 An emphasis is placed on programs, management techniques and leadership skills necessary to increase visibility of programs, growth in membership, and public awareness of the Legion and its corresponding organizations. National leaders launch the week with sessions and lectures focusing on mentoring, recognizing and building leadership traits, and putting good leadership practices to use. These skills and techniques are practiced and reinforced throughout the week in a small-group environment and in student-led meetings and presentations. Small-group workshops provide students basic leadership training in a volunteer environment. Core subjects include mentoring, leadership styles and opportunities, time management, conflict resolution and legal issues. Throughout the week, students learn the basics of developing communication strategies to promote American Legion programs, combined with the workshops and hands-on exercises. Topics include public outreach, media relations, “Reconnect” with today’s active-duty and reserve personnel, schools and community relations. Salesmanship and Marketing Developed skills make students more valuable to their posts and departments. Students’ employers also directly benefit from students’ increased effectiveness and productivity. Teachings include community networking strategies, public-relations techniques, marketing and salesmanship programs, and image-building techniques.